That's awesome Peter. Congrats to the whole team! As this thread describes it, "a handyman's challenge". Then again you just need to look at relics around the world "brought back from the brink" so it is worth a shot. At least it has now been rescued. So glad she has been brought in from the cold. Would love to see some interior shots but I expect there's not much inside. Actually Baz I took a photo of the interior on my cell phone yesterday but unfortunately I must have moved as it is rather blurred so will have another go tomorrow. 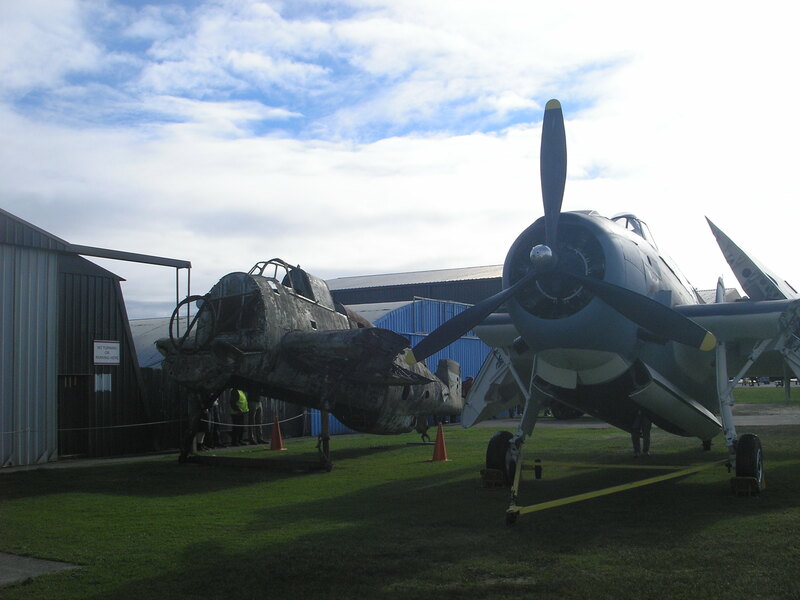 Today 2505 emerged from the hangar to be parked alongside 2539 and I have just sent some photos of the twosome through to Dave to upload. The Te Kuiti Avengers' Club re-union! 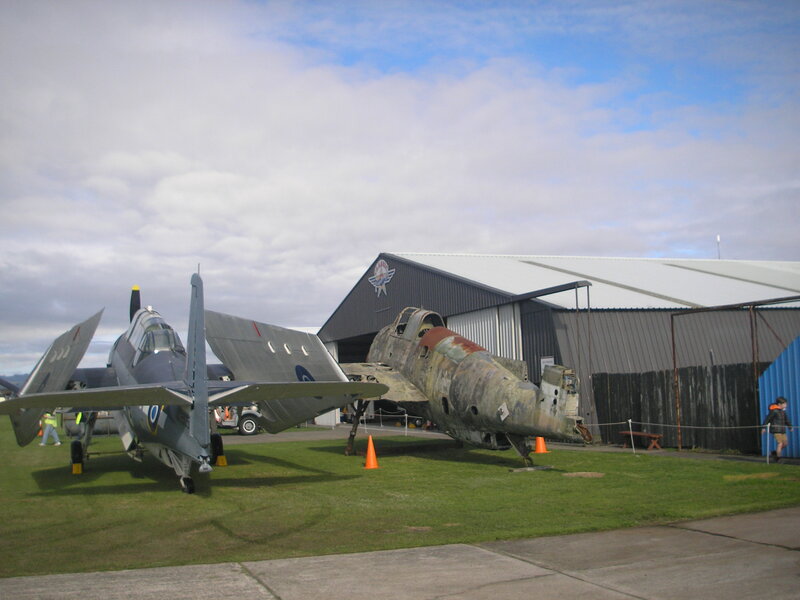 These are the same two aircraft in a Te Kuiti photo which were posted on the forum yonks ago depicting two yellow Avengers illustrating the roundel bars which caused a bit of discussion. How good is this? Peter's photos from today! I have just shed a tear. I played on this in Havelock North as a child and I have wanted it rescued ever since I saw its plight. 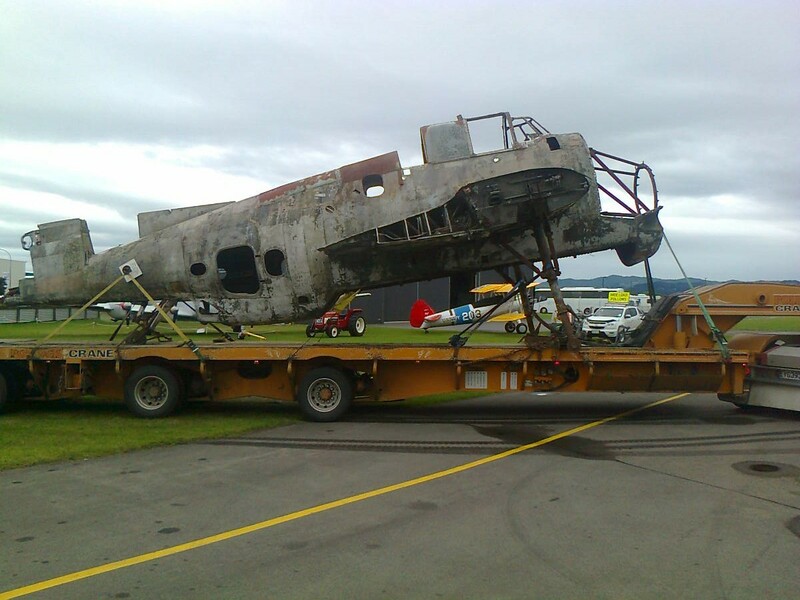 My father worked for a small engineering firm in Hastings and was involved in getting it mobile to be towed to Auckland by the new owner "for restoration". The main wheels had been removed and the legs set into concrete pillars, but when they were broken up it was discovered the stub axles had been cut off. New ones were turned up and fitted for the tow. 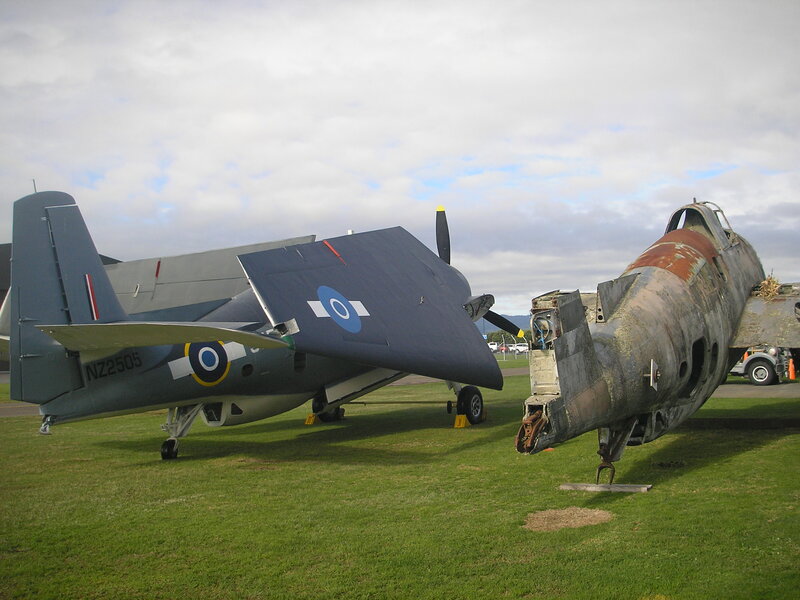 Fantastic photos of the two together and I am impressed what does seem to still be there in terms of tail gear and arrester hook parts in the tail. I guess I'd like to raise the question that if we now have three fully restored war time avengers preserved in NZ is it time to have a bright yellow target tug? This came to mind as I looked at the turret coverings with their rust and first assuming they were temporary. But they seem to be well fitted, especially around the life raft hatch, so I assume they are in fact from the original conversion? Good on you Classic Flyers I can't think of a better place for it to go. Great before and after shots Peter. I'm sure that a careful wash will reveal the remains of that old target tug paint scheme from Te Kuiti days. Last time I looked it still showed through the dust and lichen. I crawled all over and under 2539 when it was at Riverhead and am well familiar with it's condition. The rear compartment is still quite tidy and most of the fittings in place including the bombardiers panel and lots of factory decals still evident. Like Richard mentioned the tail hook retractor is still in place as are a lot of hydraulics. The bomb arming mechanism is mostly complete in the bomb bay. All credit to farmer Brian for protecting it from vandals and souvenir hunters for all those years. Pity about the state of the wing centre section and cockpit though. His offered help to complete it's shelter was never taken up. Please don't keep us all in suspense for too long about what deal's been struck and what other parts are involved. 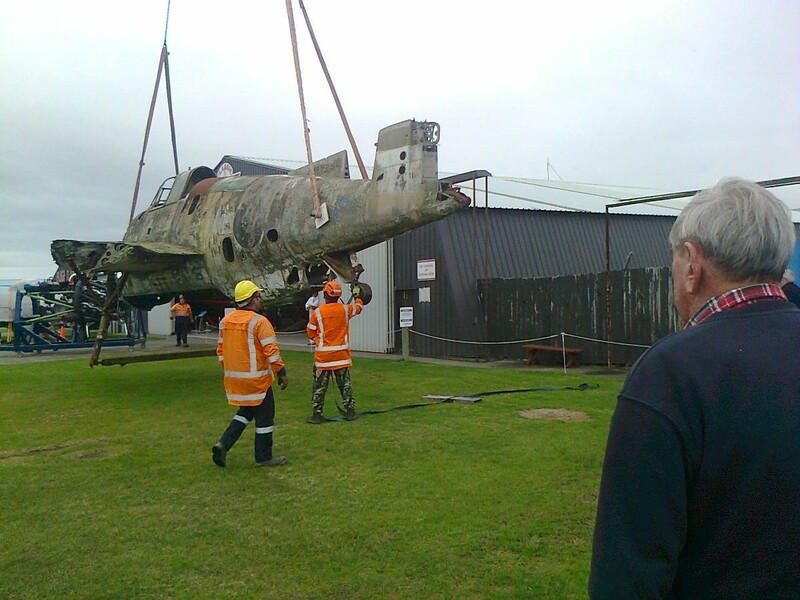 My understanding is that it will be displayed to the same standard as NZ2505 and that the wings and tail section etc are stored in Auckland for eventual restoration. In this way we are not using valuable space here for parts that won't be required for some time. I am endeavouring to find out more on what is planned and will provide an update ASAP. Thank you everyone for being so enthusiastic on this acquisition. Looks like NZ2505 has a tailhook installed. Did our ones have them as I know the Corsairs had their's removed. NZ2504 hasn't got hers. Also why did they cut the axles off?? Seems a silly thing to want to do considering they were mounted in concrete! YES!! I'm biased though having been involved with restoring NZ2504 in her target tug markings! As far as I know and comparing her with NZ2504 only the turret had a cover over it and it was alloy not steel. The canopies stayed intact so no clue why 39 has that horrible steel cover where the canopy goes. Someones attelpt to protect her from the weather? When we removed the alloy cover we found a big steel plate inside to counter the loss of weight caused by the turret's removal.